"Elgin Public Schools...it IS for everyone!" Fill out your form and return to Mrs. Heithoff with your payment of cash or check (make checks payable to Elgin Public Schools). Books will not be ordered unless paid for in advance. Annuals are delivered in August. Or, you may pay for your yearbook with a credit card by ordering online and logging onto http://www.entourageyearbooks.com . Click on "Buy" then click on "Search Your School". Type in "Elgin Public Schools (2019)". Click on the "Buy A Yearbook" icon under "Purchase" and fill in your information. Your book will be delivered in August as well. Either way, enjoy your lifetime of memories! The third and fourth graders enjoyed a visit from Linda Grosserode with the Antelope County Farm Bureau. She read a book titled "John Deere" and shared the importance of agriculture in the state of Nebraska with the students. 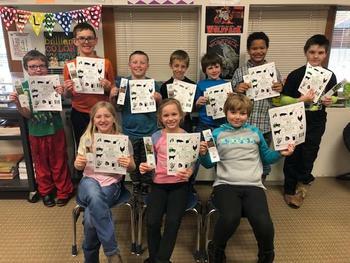 The students received agriculture activity books, bookmarks, and a copy of the book "John Deere" for our elementary library. 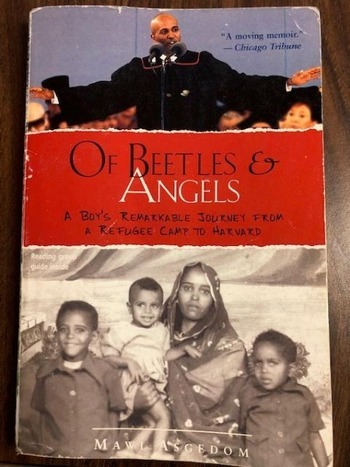 The 7th Graders recently finished reading an autobiography, Of Angels and Beetles. After reading it they were asked to write one thing they learned about life. 1. To never give up on your dreams because hard work pays off. 2. Treat everyone like an angel not a beetle. 3. One thing that I learned about of Beetles and Angels is that with hard work comes many great things in the future. 5. I learned that not being nasty to anyone ever will do great things for you in the future. 6. I learned that no matter what your background everyone is equal and should be treated fairly. 7. You should always treat people kindly, no matter their color, race, or religion. 8. I learned that you need to look at people as if they were angels sent from God. 9. I learned how you can really stand out if you try your hardest. 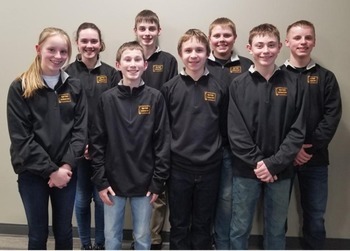 The Elgin Public Junior High quiz bowl team competed against 25 other teams at the ESU #8 tournament in Neligh today. They did very well, placing fourth behind Norfolk Jr. HIgh, Norfolk Catholic, (champions) Christ Lutheran (Norfolk). Members of the Elgin Public Speech Team did not disappoint in their final performances of the season. 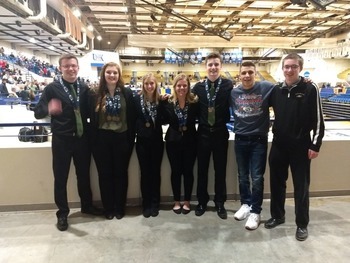 The squad returned from the State Speech Championships in Kearney with nine medals. As a team, they placed 5th overall out of the thirty-three teams that competed in class D2. Four of the team’s eight state-qualifying events broke finals to earn medals. Top honors on the day went to Kira Widger, who captured the third place medal in Serious Prose. The Duet of Widger and Theanna Dunn earned 5th place medals. Grace Rittscher placed 5th in Humorous Prose as well. The OID of Widger, Rittscher, Dunn, Hunter Reestman and Adam Dreger placed 6th. This year’s new rule allowing for speech team members to enter in three events at conference, districts and state allowed Widger to do something no EPS Speech Team member has ever been able to accomplish. She returned home with three state medals. Jordan Lindgren received a Superior Rating in Informative Speaking. RIttscher and Reestman each earned a Superior Rating in Entertainment Speaking. The Duet of Dreger and Cory Romej earned an Excellent Rating. Co-coaches Jessie Reestman and Stacy Shumake-Henn were satisfied with the way the season concluded. The coaches had words of praise for Widger and her fellow seniors. When the EPS Speech Team left for the D2-2 District Speech Contest in Bancroft on Wednesday, they had no idea they wouldn’t be returning home until Friday morning. They also had no idea of the success they would experience. The team returned with seventeen medals and the D2-2 District Runners-up plaque. 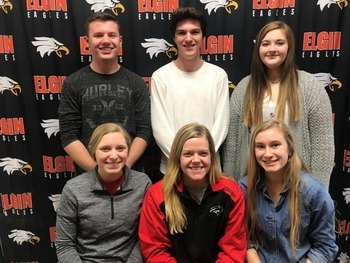 Seven team members will represent Elgin in eight events at the state competition. Kira Widger, Theanna Dunn and Hunter Reestman brought home top honors on the day. Widger and Dunn’s Duet won gold, as did Reestman’s Entertainment speech. Runners-up medals were earned by Adam Dreger and Cory Romej in Duet, Widger in Serious Prose, and Grace Rittscher in Humorous Prose. The OID of Reestman, Widger, Rittscher, Dreger and Dunn was also crowned runners-up after tying for the title of champion with St. Edward. Rittscher captured 3rd place with her Entertainment speech. Jordan Lindgren punched his ticket to state with his Informative speech, placing 3rd. Rittscher and Widger accomplished a feat new to the speech team this year. Both are triple entered at the state speech contest. Widger will be competing in OID, Duet and Serious. Rittscher is going in OID, Humorous and Entertainment. This is the first year speech competitors have been allowed to participate in three events in district competition. Brea Carr narrowly missed a trip to state, placing 4th in Extemporaneous Speaking, while Reestman placed 5th. Dunn placed 5th in Serious Prose as well. Olivia Lindgren and Mateo Kirstine earned Superior Ratings in Poetry, as did Talena Woodard in Humorous Prose. Co-coaches Jessie Reestman and Stacy Shumake-Henn were thrilled with the day’s events. Following a late but joy-filled awards presentation, the team was faced with a new dilemma: How to get home. Due to the flooding, all roads home were closed. Superintendent Dan Polk took action, booking rooms so both Elgin teams (EPS and PJ), could take refuge in West Point. Upon their safe arrival, the teams were taken care of well by accompanying parents and grandparents, as well as the town of West Point. “We just can’t thank everyone enough for their help. Mr. Polk, Duane [bus driver], the parents, and grandparents were terrific through this whole experience. Even community members from home contacted people they knew in West Point to offer help. And the town of West Point was unbelievable. Their constant care and attention throughout the ordeal was amazing. I also have to give credit to the kids for keeping things in perspective. They were troopers,” said Shumake-Henn. The students busied themselves in a number of ways, including making new friends with the St. Edward and North Bend teams who were stranded right along with them. As roads at home cleared up, West Point’s status worsened. However, the team was able to make it home Friday morning, after tirelessly searching for possible routes. 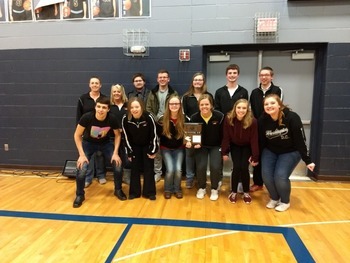 The team will compete at the State Speech Championships in Kearney on Friday and hope to return that same night! 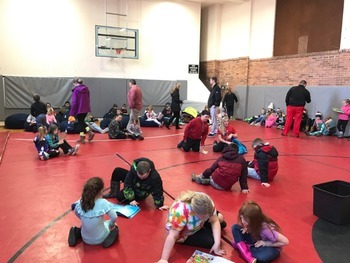 12:50-1:10ish Buddy Reading with K-12 in Big Gym – Jr. High and High School kids will bring a book to read the little ones. Study hall teachers please remind them Monday to bring a book from home or from the library! Elgin Public Elementary students are completing a reading challenge to expand their love of reading! We are posting pictures as they come in so please check back often! Click on the photos to see even more photos! Great job, students! accumulative GPA of 3.5 or higher. GOLF at Scotus 9:00 a.m.
We are having regular school hours today! TR at Creighton 1:30 p.m.
TR JH at Genoa 9:00 a.m. GOLF NVC at Clearwater-Orchard 9:00 a.m.
TR Norfolk Classic 4:00 p.m.
TR HS & JH NVC Meet at West Holt 9:30 a.m. GOLF at West Holt 9:00 a.m.
TR JH at Plainview 2:30 p.m.
TR at Humphrey 9:00 a.m. GOLF at Niobrara-Verdigre 9:30 a.m.
Elgin Youth BBall Lock-In 9:00 p.m. to 7:00 a.m.